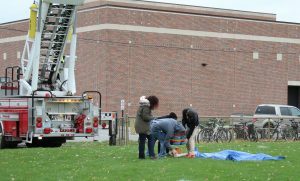 On Tuesday, October 31st, 2017 the GHS Engineering/Technology Department hosted the ninth annual Pumpkin Drop at Goshen High School. Engineering classes from GHS and Fairfield competed to see who could successfully build a vehicle capable of sustaining a 50 foot fall, protecting their passenger (a pumpkin) from injury. The rules and goal of the assignment are below. 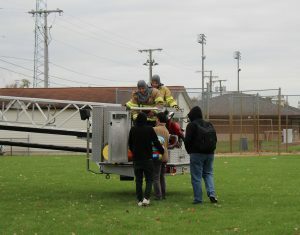 The Goshen Fire department provided a ladder truck to achieve the 50’ drop height and a championship round 102’ drop height. There were 20 teams of students competing – 12 teams from Goshen and 8 teams from Fairfield. Surviving the 50’ drop were 6 teams from Goshen and 1 team from Fairfield. Those 7 teams then proceeded to the next round which was the 102’ drop. None of Fairfield’s teams survived that round, while Goshen had 4 of their 6 finalist teams survive. Loading the enclosures with the pumpkins inside. Dropping the enclosure (this is from 50′). Checking to see if the pumpkin survived. 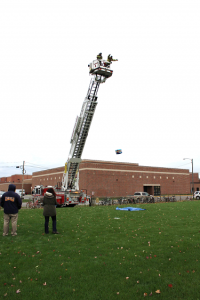 The goal of the pumpkin drop competition is to design an enclosure or apparatus to protect a pumpkin from damage when dropped from the bucket of a fire truck 50 feet high. Entries that survive the 50 foot fall will then be dropped from the maximum height of 80-100 feet. Pumpkin must be at least 10 inches in diameter or larger and must be orange in color. Pumpkin and protective structure weight is limited to 50 pounds. The pumpkin container can have dimensions no greater than 20x20x30 inches. Pumpkins must free fall (no bungee cords). No Styrofoam peanuts or other small non-biodegradable packing fillers are allowed. No hard materials: no wood, metal, PVC pipe or glass is allowed for the exterior of the container. Soft garbage cans are acceptable. No electrical sources are allowed. Package must be designed so that the pumpkin can be removed by the ground crew within 30 seconds after hitting the ground. Protective structure around the pumpkin must be designed with public safety and cleanup in mind. Pumpkin enclosures that might splatter fragments or liquids toward the viewing audience are not allowed. Any entries that employ parachutes must be designed so that the parachute is dropped at the same time as the pumpkin or prior to the pumpkin, NOT after. The judges will have the final say on whether entries are viewed as safe to be dropped. Judges will disqualify entries with heavy, sharp, and/or protruding metal parts. All decisions by judges are final. To keep the drops moving efficiently, someone from the team MUST remain with the pumpkin at all times. Ed Ernstes from WBST News was there to cover the Pumpkin Drop. He will air the story at around 6:15-6:20 this evening on WSBT News. 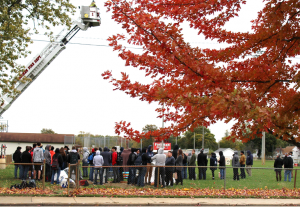 Thank you to Jen Yoder, Industrial Technology teacher, who coordinated the logistics of the Pumpkin Drop, and to the City of Goshen for the use of the fire truck and the cooperation of the firefighters. What a great opportunity for students to put their design ideas to the test! All-you-can-eat pancakes and sausage are yours for only $6! Or get a complimentary breakfast when you register for the run/walk. The 5K run and 3K walk begin at 9:00 a.m. at Goshen High School. Registration Early Bird Special $20 (through November 10). Regular price is $25 (day of the event). Bring cash or a check payable to “GHS Music Council.” All runners and walkers get a complimentary pancake breakfast after finishing the race. 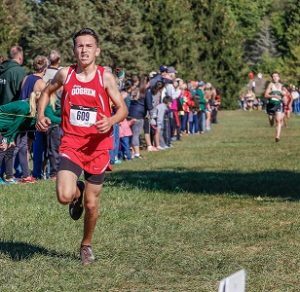 Check-in will take place in the main lobby (Door “M”) of Goshen High School starting at 8:00 a.m. Please plan to arrive at least 15 minutes prior to the start of the race. There are free t-shirts available for runners/walkers, but supplies are limited. The run/walk starts across from GHS in the bus parking area, near the intersection of Lincolnway and Monroe. Participants start in the sidewalk along Monroe, proceed along portions of the Abshire Park Trail & Pumpkinvine Nature Trail toward Abshire Park, and loop back around to finish the race on the sidewalk along Monroe. Approximate routes available here (red = 5K Run, blue = 3K Walk). After the event, return to the cafeteria for breakfast, awards, and door prize raffle drawings! Please Note: The event will not be canceled due to inclement weather. 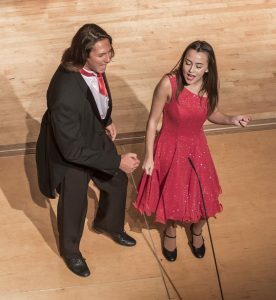 All proceeds go the Goshen High School Music Department for student scholarships. If you have questions, you may call the GHS Music Office at 574-533-8651, ext. 2518. GHS: Thank you for the support last week! Women’s Empowerment Club will have another fundraiser to benefit the Elkhart YWCA during all lunches TODAY in the commons. We will be selling stickers, pins and bracelets (no hair extensions this time) to raise awareness for breast cancer and domestic violence. The boys varsity football team will host Concord this Friday at 7:00 p.m. Tickets are $6 and no all-sport, season tickets or activity cards can be honored due to it being a state tournament event. We will presale tickets in the athletic office Tuesday-Friday if you want a ticket to avoid lines. Join us TONIGHT for “Treat or Trunk” in the circle drive at GHS from 6-8:00 p.m. MYA invites you to participate in the trunk competition! 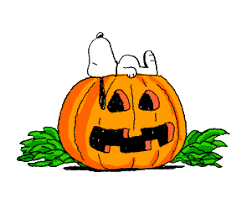 Bring decorations for your trunk and treats to share with children in the community by 5:00 p.m. Everybody is welcome! “Treat or Trunk” en el estacionamiento de GHS. El martes 31 de octubre de 6-8:00 p.m. MYA te invita a participar en la competencia de cajuelas de carro. Decora tu cajuela y trae tus dulces para darle a los niños de la comunidad. Debes llegar a las 5:00 p.m. Todos son bienvenidos! IHSAA Student-Athlete Tip of the Week: While reading the sports page the last few weeks, I couldn’t help but notice how close the scores were during the volleyball state tournament run. But in reality, that’s true in all sports. The farther you advance during the tournament, the tougher the games become. Which brings me to the conclusion that the points scored at the beginning of each game are just as important as those scored late in the contest. In other words, don’t beat yourself up if you happen to be the one that makes a crucial mistake at the end of the game. Every play is important. Every mistake is important. Every point is important. The truth is, however, that most players, fans and friends remember the last few plays, and not those that happen throughout the entire game. When you have a teammate that happens to make a crucial mistake at the wrong time or late in the game, please remind them it was just one play. The final score is always determined by every play during the entire match, meet or game! This Thursday is the first Thursday of the month. This means that Student Faculty Senate will meet before school in the media center at 7:45 a.m. Any groups participating in Marketing Mall should have student representatives there to get approval for sales. All group sponsors should attend. Attention Students: Herff Jones will be here on Thursday at 7:45 a.m. to take class ring orders for any grade, and for senior orders for caps and gowns, graduation announcements and other senior items. Extra packets are available in the main office. Attention all boys interested in playing basketball this season…..Tryouts begin Monday, November 6th. All 9th graders should report for tryouts from 7:00-8:45 a.m. in the Main Gym. All 10th-12th graders need to report after school in Whiteman Gym until 6:00 p.m. Anyone planning on trying out needs to make sure a completed physical form and all other necessary paperwork are turned into the Athletic Office THIS week. Check in with Athletics if you are unsure. See Coach Wohlford in room 1420 with any questions. There will be a meeting for any student interested in the marine biology trip TODAY during the 2nd session of SRT in room 3070. If you have any interest in this trip, please plan to attend. If you have interest in the trip but are unable to attend the meeting, please see Mrs. Weaver in room 3070. 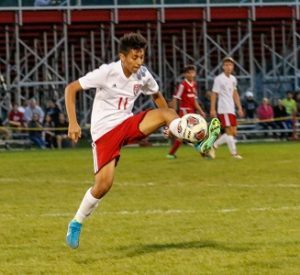 There’s a mandatory meeting for all boys soccer players (C team, JV and varsity) during the 2nd session of SRT in the main gym TODAY. If you cannot make it to the meeting please see Coach Bontreger, Coach Bjorkland or Coach Maust Emery. French Club will meet TODAY during the 2nd session of SRT in room 2410. There will be a mock trial meeting in room 2350 during the 2nd session of SRT on Thursday. Key Club will meet in the cafeteria on Thursday during the 2nd session of SRT. Students who missed the last meeting or have not yet turned in their application should plan to pay the membership fee plus the late fee. Applications are available in Mrs. Dubash’s room, 1311. Also, please bring Trick-or-Treat for UNICEF collection boxes to the meeting. Student Athletic Council will meet on Thursday during the 2nd session of SRT in the main gym. All juniors and seniors involved or planning to be involved with athletics this school year are encouraged to attend. We will be signing up for our “canning” fundraiser for Special Olympics Indiana at Kroger, as well as participating in a leadership activity and dining on treats. Congratulations to the football team on advancing to the sectional championship for the 2nd year in a row! We will host Concord this Friday at 7:00 p.m. Tickets are $6 and no all-sport, season tickets or activity cards can be honored due to it being a state tournament event. We will presale tickets in the athletic office Tuesday-Friday if you want a ticket to avoid lines. Congratulations to members of the Crimson Marching Band for a fantastic performance at the ISSMA Semi-State competition this past weekend! Your performance qualified for state finals, but unfortunately a penalty knocked us out of the top 10! We are proud of you and know you are truly among the best bands in Indiana! Join us TOMORROW for “Treat or Trunk” in the circle drive at GHS from 6-8:00 p.m. MYA invites you to participate in the trunk competition! Bring decorations for your trunk and treats to share with children in the community by 5:00 p.m. Everybody is welcome! “Treat or Trunk” en el estacionamiento de GHS. El martes 31 de octubre de 6-8:00 p.m. MYA te invita a participar en la competencia de cajuelas de carro. Decora tu cajuela y trae tus dulces para darle a los niños de la comunidad. Debes llegar a las 5:00 p.m. Todos son bienvenidos! There will be a meeting for any student interested in the marine biology trip TOMORROW during the 2nd session of SRT in room 3070. If you have any interest in this trip, please plan to attend. If you have interest in the trip but are unable to attend the meeting, please see Mrs. Weaver in room 3070. French Club will meet TOMORROW during the 2nd session of SRT in room 2410. 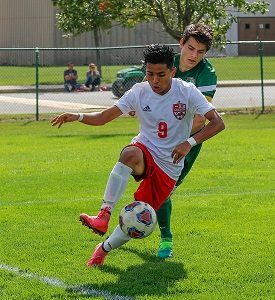 There’s a mandatory meeting for all boys soccer players (C team, JV and varsity) during the 2nd session of SRT in the main gym on Tuesday, November 7th. If you cannot make it to the meeting please see Coach Bontreger, Coach Bjorkland or Coach Maust Emery. Girls basketball will host a scrimmage vs. Bethany at 6:00 p.m. Good luck ladies! 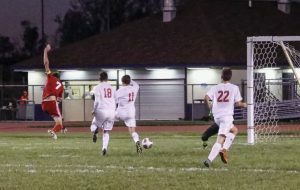 The boys soccer team, who were NLC champions, Sectional champions, Regional champions, and Semi-State Runner-ups, placed six athletes on the NLC first team. 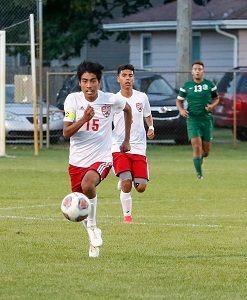 They included: Seniors Junior Argueta, Lucas Bontreger, Manuel Castillo, Flavio Cruz, Marcos Hernandez, and Alex Martinez. 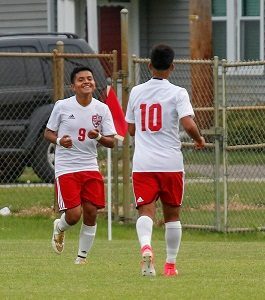 Earning Honorable Mention were senior Chris Garcia and junior Sergio Gonzalez. The team finished the year at 17-4, 6-1 in the NLC. 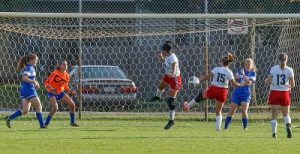 The girls soccer team placed two players on the NLC first team: Senior Jill Kissinger and junior Aniya Hartzler. Earning Honorable Mention status were juniors Maggie Gallagher and Alexa Medina. The girls team finished 5-2 in the NLC. 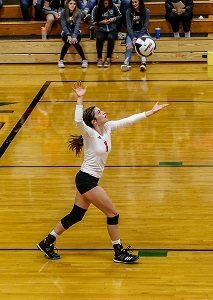 The volleyball team had one player earn NLC honors, Raina Shreiner Barger, who was selected for the Honorable Mention team. Congratulations to these student athletes who represented their school and the Goshen community with excellence! Join us for “Treat or Trunk” in the circle drive at GHS on Tuesday, October 31st from 6-8:00 p.m. MYA invites you to participate in the trunk competition! Bring decorations for your trunk and treats to share with children in the community by 5:00 p.m. Everybody is welcome! “Treat or Trunk” en el estacionamiento de GHS. El martes 31 de octubre de 6-8:00 p.m. MYA te invita a participar en la competencia de cajuelas de carro. Decora tu cajuela y trae tus dulces para darle a los niños de la comunidad. Debes llegar a las 5:00 p.m. Todos son bienvenidos! Next Thursday is the first Thursday of the month. This means that Student Faculty Senate will meet before school in the media center at 7:45 a.m. Any groups participating in Marketing Mall should have student representatives there to get approval for sales. All group sponsors should attend. GHS girls soccer received some great news this week. 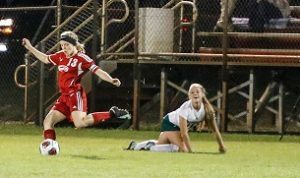 Congratulations to Jill Kissinger for being selected to the 2017 All District team! 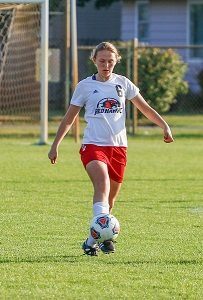 Jill will be representing GHS for the second time in the all district soccer games in Indianapolis on November 18th and 19th. Also earning state recognition was Aniya Hartzler, who was voted to the Second All District team. Both Aniya and Jill were NLC all-conference selections this fall and helped lead the GHS girls to a 10-4-3 record this season. Attention wrestlers – The team gear flyer is available. Stop by the main office to pick one up from Coach Pickard. Attention Students: Herff Jones will be here on Thursday, November 2nd at 7:45 a.m. to take Class Rings orders for any grade, and for senior orders for caps and gowns, graduation announcements, and other senior items. Extra packets are available in the main office. The Senator Richard G. Lugar Scholarship Nomination Form is now available in the Guidance Office. The requirements are a combined SAT of at least 1,000 or an ACT Composite Score of 22. There will be a meeting for any student interested in the marine biology trip next Tuesday, October 31st during the 2nd session of SRT in room 3070. If you have any interest in this trip, please plan to attend. If you have interest in the trip but are unable to attend the meeting, please see Mrs. Weaver in room 3070. French Club will meet during the 2nd session of SRT on Tuesday, October 31st in room 2410. There will be a mock trial meeting in room 2350 during the 2nd session of SRT on Thursday, November 2nd. Student Athletic Council will meet on Thursday, November 2nd during the 2nd session of SRT in the main gym. All juniors and seniors involved or planning to be involved with athletics this school year are encouraged to attend. We will be signing up for our “canning” fundraiser for Special Olympics Indiana at Kroger, as well as participating in a leadership activity and dining on treats. 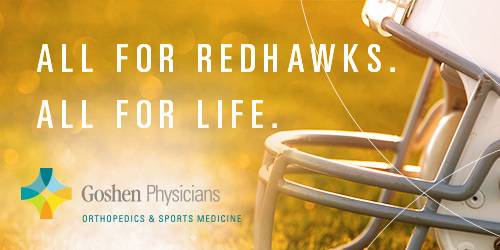 The boys varsity football team will play in sectional semifinals at Central at 7:00 p.m. Go RedHawks! GMS Master Teacher Liz Martin was recognized after she was named to the 2017-18 National Institute for Excellence in Teaching (NIET) Educator Advisory Board. Ms. Martin is one of only eleven educators chosen from across the country. 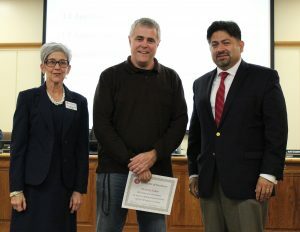 GHS art teacher Tom Zuber was honored after he captured two 2017 American Art Awards. He won 1st place in Abstract Expressionism and tied for 6th place in Cubism, in a competition that featured artists from around the globe. Tom said that it was a privilege to be able to share the award with his students, noting that “It is good for them to see a working artist, living the dream”. 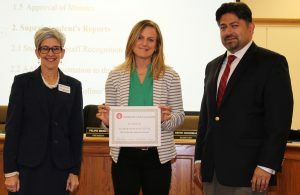 Gaby Tovar, GHS Parent Liaison, was recognized for her work in organizing and coordinating interpreters for the GHS Parent/Teacher conferences. Ms. Tovar got the interpreters matching shirts so that they were easily identifiable to parents, and also developed a new system for the teachers that made it easier for them to access the translators. Ms. Tovar was recognized in absentia, because she is continuing her education and needed to attend an evening class. She did, however, send her thanks to the board for the acknowledgement of her efforts. All blood drive appointments must be made by the end of the day TODAY. No walk-ins will be allowed on Friday. Please see Mrs. Clark in room 2280 or send her an email to make an appointment. Women’s Empowerment Club will have a fundraiser in the commons during all lunches TODAY. Proceeds will go to the Elkhart YWCA. We will be selling pins, stickers, bracelets and hair extensions to raise awareness for breast cancer and domestic abuse. We will have a professional onsite during lunch to clip in the extensions. FREE PIZZA!!!! Join us TONIGHT from 6:00-8:00 p.m. in the cafeteria to hear from Goshen College’s admissions department on how to achieve you college goals. There will also be a lesson on how to check student grades and pizza will be provided. This workshop will be in English and Spanish. Anyone interested in chess club should meet in room 1060 after school TODAY from 3:45 to 4:45 p.m. Please see Mr. Cross with questions. Bethel College will be here TODAY from 8:30 a.m. to 12:00 p.m. for on-site admissions in the guidance office. They will waive you application fee and can give you an admissions decision THAT DAY! Please come to guidance to sign up for a time slot and fill out your application beforehand. See Mrs. Gomez Wengerd if you have any questions. Stay In Bounds Ambassadors will make their first visits this week TODAY. Please make sure you know your schedule, have your lesson plan ready and meet Mr. Kissinger at the welcome center immediately after 2nd period on the day of your visit. Winter season cheerleading tryouts will be TONIGHT at 6:00 p.m. We will meet in the warehouse. This tryout will only be for girls. GMen will be contacted at a later date. All athletic paperwork needs to be turned into the athletic office to attend tryouts. If you have any questions, please contact Coach Kristy via email at kristy.sloan@goshenschools.org. Student Council will meet TODAY in the auditorium during the 2nd session of SRT. 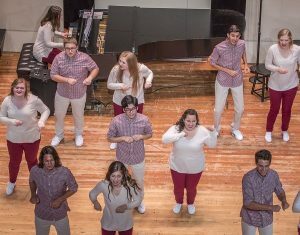 Last night was the Fall Preview Concert for the GHS Crimsonaires. 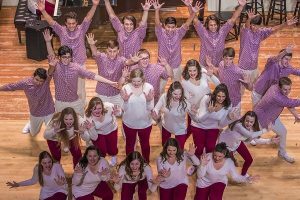 It was Katie Miller O’Leary’s first year as the solo director of the group; the first year since the retirement of long-time Crimsonaires director Marcia Yost. 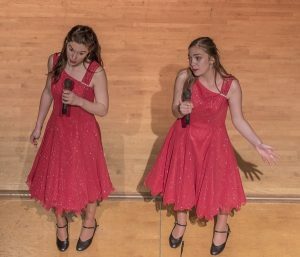 But Katie’s three years as a singer in the Crimsonaires and one year as co-director clearly had her prepared. She guided the students (many of whom are brand new to the group) through their first concert of the year with apparent ease. She acknowledged that “it takes a village” and thanked the many staff members and parents who have helped the Crimsonaires get the year off to a good start. 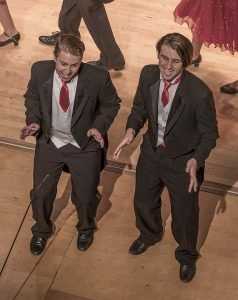 Below are a few pictures from the concert, courtesy of photographer Branden Beachy. 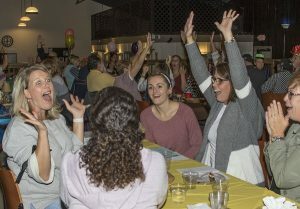 The GCS Foundation held their 5th annual Community Trivia Night fundraiser on October 24th at the Peddlers Village Event Center, and all indications are that the fundraiser was once again a huge success! 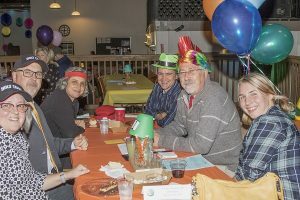 Everyone had a good time, and in the process they raised approximately $8,000 for the foundation. 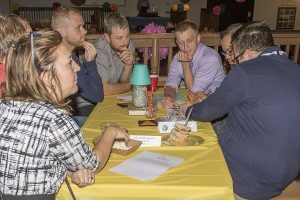 There were 40 teams entered in the event, made up of educators, business leaders, and community members. There were many awards given at the end of the evening, including: The Top Overall Team; Team Spirit; Top Corporate Team, Top Community Team, Top School Team, and Enrichment Team. 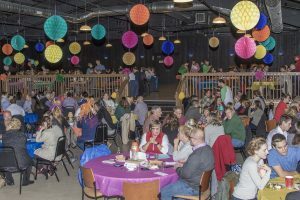 Prizes were sponsored by Goshen Brewing Company, Linway Cinemas, Southside Soda Shop, The Nut Shoppe, the GHS Red Zone, Maplecrest Insurance, and Peddlers Event Center. Pictured below are just a few of the school teams. Chandler, looking a little festive for the evening! GMS, just a little more focused and serious about the event. West Goshen, excited and clearly going for the spirit award! The stated goal of the foundation is “To identify educational projects that we can turn from a dream into a reality that will profoundly impact students in the Goshen community today and tomorrow”. Some of the projects they have sponsored thus far are: IB Experience Retreat for GMS students at Ball State, Lego Robotics supplies for Chandler, 3-D printer for GHS & GMS technology, Minds in Motion at elementary schools (with United Way), GMS Academic Superbowl materials, GHS Athletics & Music programs, GCS Orchestra 100th Anniversary Original Composition, GHS Super Mileage program, Guitarion for GMS Mariachi Strings program, and Business & Personal finance software for GHS. Sponsors for the event (many of whom sponsored groups of teachers who represented their schools) included: Barton-Coe-Vilamaa, Fabric Services, Robert Weed Plywood, Bruce and Barbara Stahly, Goshen Rotary, Indiana Wood Products, Interra Credit Union, Kruggel Lawton CPAs, Miller Poultry, Sorg Dodge, and Yoder, Ainlay, Ulmer & Buckingham. On behalf of the students and staff members who benefit from the GCS foundation grants, we offer a huge THANK YOU to all of the event sponsors! Women’s Empowerment Club will have a fundraiser in the commons during all lunches TOMORROW. Proceeds will go to the Elkhart YWCA. We will be selling pins, stickers, bracelets and hair extensions to raise awareness for breast cancer and domestic abuse. We will have a professional onsite during lunch to clip in the extensions. FREE PIZZA!!!! Join us TOMORROW from 6:00-8:00 p.m. in the cafeteria to hear from Goshen College’s admissions department on how to achieve you college goals. There will also be a lesson on how to check student grades and pizza will be provided. This workshop will be in English and Spanish. Last night the Lady RedHawks tied Elkhart Central 10-10 in high school bowling. 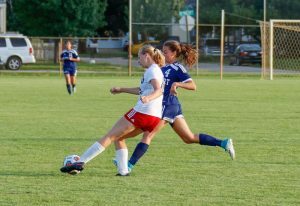 The RedHawks were led by Katie Kercher, Ebony Jessen and Kaylie Hurst. Thank you to everyone who has signed up for this Friday’s blood drive. Please make sure to check your email for important information. If anyone else would still like to sign-up, see Mrs. Clark in room 2280, or email her at jclark@staff.goshenschools.org. Anyone interested in chess club should meet in room 1060 after school TOMORROW from 3:45 to 4:45 p.m. Please see Mr. Cross with questions. TOMORROW from 8:30 a.m. to 12:00 p.m. you can sign up for on-site admissions with Bethel College in the guidance office. They will waive you application fee and can give you an admissions decision THAT DAY! Please come to guidance to sign up for a time slot and fill out your application beforehand. See Mrs. Gomez Wengerd if you have any questions. Stay In Bounds Ambassadors will make their first visits this week TOMORROW. Please make sure you know your schedule, have your lesson plan ready and meet Mr. Kissinger at the welcome center immediately after 2nd period on the day of your visit. Winter season cheerleading tryouts will be TOMORROW at 6:00 p.m. We will meet in the warehouse. This tryout will only be for girls. GMen will be contacted at a later date. All athletic paperwork needs to be turned into the athletic office to attend tryouts. If you have any questions, please contact Coach Kristy via email at kristy.sloan@goshenschools.org. Student Council will meet TOMORROW in the auditorium during the 2nd session of SRT. French Club will meet during the 2nd session of SRT on Thursday, November 2nd in room 2410. Anyone interested in chess club should meet in room 1060 after school this Thursday from 3:45 to 4:45 p.m. Please see Mr. Cross with questions. On Thursday from 8:30 a.m. to 12:00 p.m. you can sign up for on-site admissions with Bethel College in the guidance office. They will waive you application fee and can give you an admissions decision THAT DAY! Please come to guidance to sign up for a time slot and fill out your application beforehand. See Mrs. Gomez Wengerd if you have any questions. Stay In Bounds Ambassadors will make their first visits this week TODAY and/or on Thursday. Please make sure you know your schedule, have your lesson plan ready and meet Mr. Kissinger at the welcome center immediately after 2nd period on the day of your visit. Winter season cheerleading tryouts will be TODAY from 4:00-6:00 p.m. and on Thursday at 6:00 p.m. We will meet in the warehouse. This tryout will only be for girls. GMen will be contacted at a later date. All athletic paperwork needs to be turned into the athletic office to attend tryouts. If you have any questions, please contact Coach Kristy via email at kristy.sloan@goshenschools.org. French Club will meet TODAY during the 2nd session of SRT in room 2410. We will discuss t-shirt designs and celebrate Halloween! The next German Club meeting will be TODAY during the 2nd session of SRT in the main gym balcony. We will be painting a recycling barrel and discussing Oktoberfest. There will be a girls golf meeting TODAY during the 2nd session of SRT in Whiteman gym. For all girls interested in playing tennis next spring, there will be an informational meeting in the main gym TODAY during the 2nd session of SRT. If you are unable to attend, please make arrangements with Coach Love to get the information. Student Council will meet on Thursday in the auditorium during the 2nd session of SRT. We hope you enjoyed your Fall Break! Stay In Bounds Ambassadors will make their first visits this week on Tuesday and/or Thursday. Please make sure you know your schedule, have your lesson plan ready and meet Mr. Kissinger at the welcome center immediately after 2nd period on the day of your visit. Goshen High School will host a Red Cross blood drive on Friday! Sign-ups are happening now in social studies classes. See Mrs. Clark in room 2280 with questions or a permission form. Winter season cheerleading tryouts will be TODAY and TOMORROW from 4:00-6:00 p.m. and on Thursday, October 26th at 6:00 p.m. We will meet in the warehouse. This tryout will only be for girls. GMen will be contacted at a later date. All athletic paperwork needs to be turned into the athletic office to attend tryouts. If you have any questions, please contact Coach Kristy via email at kristy.sloan@goshenschools.org. The next German Club meeting will be TOMORROW during the 2nd session of SRT in the main gym balcony. We will be painting a recycling barrel and discussing Oktoberfest. There will be a girls golf meeting TOMORROW during the 2nd session of SRT in Whiteman gym. For all girls interested in playing tennis next spring, there will be an informational meeting in the main gym TOMORROW during the 2nd session of SRT. If you are unable to attend, please make arrangements with Coach Love to get the information. The boys varsity football team lost to Wawasee 0-20. The boys freshman football team lost to Plymouth 43-15. 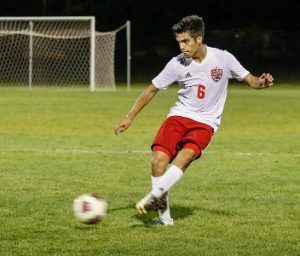 The boys varsity soccer team lost 0-2 at the semi-state soccer matchup, against Lafayette Harrison. The team finished the season with a record of 17-4. 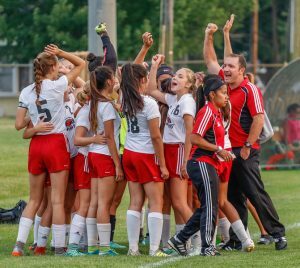 The girls varsity soccer team had another great season finishing with an overall record of 10-4-3 and 3rd in the Northern Lakes Conference. Congratulations to Jill Kissinger, Hannah Kurtz and Aniya Hartzler for being named this week to the NLC all conference team. Maggie Gallagher and Alexa Medina made the NLC honorable mention team. 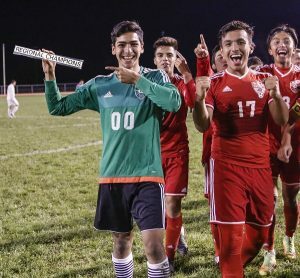 The Goshen boys soccer team put a little scare into the hearts of their fans on Monday night in the regional championship game at Merrillville, when they gave up two goals within the first 15 minutes of the game. 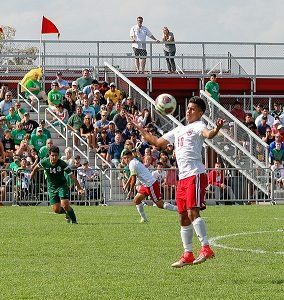 But the boys regrouped, showed their mental toughness, and battled back to win the game 4-2, thrilling all of the Goshen fans in attendance (and those following on Twitter and Facebook at home). The team will play #1 ranked Lafayette Harrison in Semi-State action on Saturday, October 21 at 5:00 p.m. at Kokomo High School. 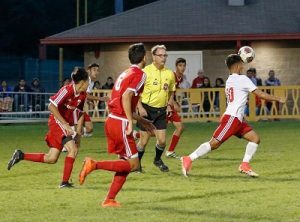 A huge thank you to the boys for their great display of RedHawk resilience and to the students, parents, and fans who supported them. We hope to see all of you again (and more!) in Kokomo on Saturday. GO BIG RED! Puro Goshen. 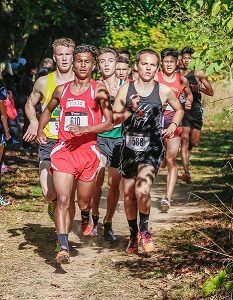 Congratulations to the boys cross country team, who placed 4th at Regionals on Saturday, October 14th (even higher than their finish at Sectionals!). 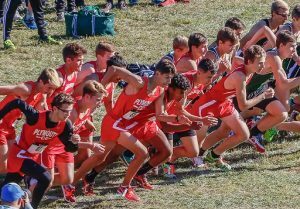 The boys advance to semi-state on Saturday, October 21st at IPFW at 1 p.m.
Congratulations to the boys XC team on their 4th place finish at the Regional meet last Saturday. 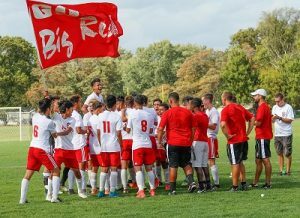 THe boys advance to semi state this Saturday at IPFW this SAturday at 1 PM. Good luck boys! 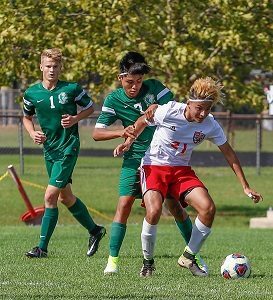 Congratulations to the Boys Soccer team on their come from behind win over Crown Point on Monday to become Regional champs for the 3rd time in program history, all under Coach Viratham Mounsithiraj. 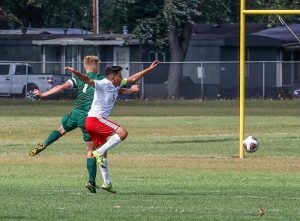 THe boys fell behind 2-0 in the first 12 minutes, but took control from that point forward to win 4-2. 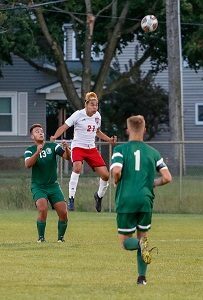 THe boys play #1 ranked Lafayette Harrison on Saturday at 5 PM at Kokomo HS. Of the 1.6 million students that took the PSAT nationwide, these GHS students are in the top 34,000! Congratulations to all of you, well done!! Coach Viratham Mounsithiraj (Coach V to those who know him well) has been around a while. 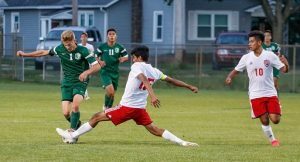 He’s been the boys soccer head coach at Goshen High School for 14 years, accruing a career record of 168-64-28. 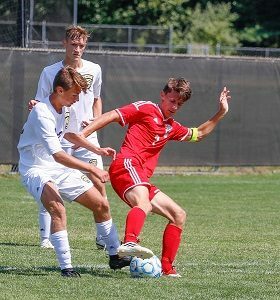 Included in that total, he has a final four appearance from when soccer was still a single-class sport (2009), and one state title (2014). 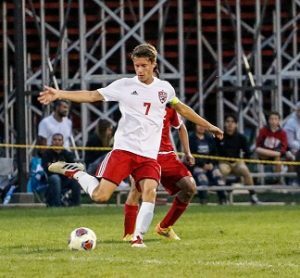 Coach V’s staff has also been pretty consistent, with Myron Bontreger (GHS Spanish teacher) and Matt Bjorkland (GHS math teacher) both on the staff for the past 10 years, and Rusty Maust Emery (a former GHS soccer player and current GHS math teacher) for 2 years. The RedHawks are 15-3 so far on the season; they are Northern Lakes Conference champions and sectional champions. They are healthy and playing well together, and they are looking to extend their season. Of the 2014 state champion team, two players remain. They were JV players in 2014, brought up to varsity for the tournament run. 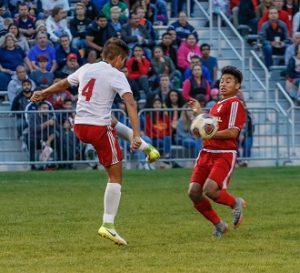 They are Alex Martinez, who controls the midfield for the RedHawks, and Lucas Bontreger, who plays forward and has earned the GHS career scoring (53) AND assist (26) records. 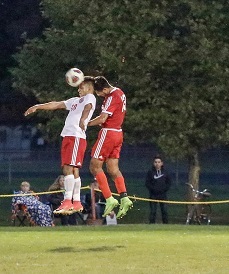 The state tournament roster includes: #00 sophomore goalkeeper Nehemias Gallegos, #1 junior goalkeeper Juan Muro Medina, #2 sophomore forward/midfielder Kevin Cruz, #3 junior midfielder Saulo Luna, #4 junior defender Sergio Gonzalez, #5 senior defender Chris Garcia, #6 senior defender Flavio Cruz, #7 senior forward Lucas Bontreger, #8 senior midfielder Sebastian Palacios, #9 senior midfielder/forward Anibal Argueta, #10 senior midfielder Alex Martinez, #11 senior midfielder Diego Loera, #12 junior defender Jaiden Daniels, #13 junior midfielder Efren Ortega, #14 freshman midfielder/forward Fernando Quevedo, #15 senior defender Manuel Castillo, #16 freshman defender Cesar Valdez, #17 junior midfielder/forward Ciro Aguilar, #18 sophomore forward Eduardo Rodriguez, #20 sophomore defender Emylio Romo, #21 senior forward/midfielder Marcos Hernandez, and #23 junior midfielder Ricardo Vargas Ortiz. Many of the boys have been playing soccer together for a number of years. 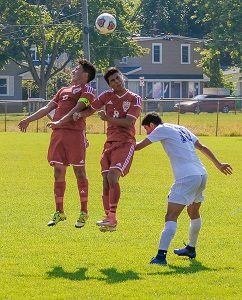 They started out early on as Goshen Youth Soccer Organization (GYSO) players, under the direction of Coach V’s brother, Tavi Mounsithiraj. 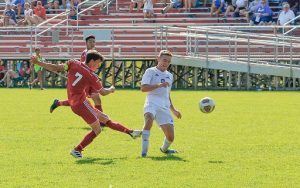 After that, many of the boys played for the Goshen Stars and other traveling teams under the direction of Myron Bontreger. 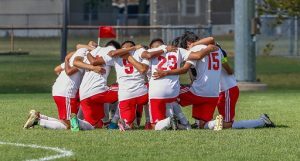 They start every game by gathering on the field, taking a knee, collecting themselves, yelling “Puro Goshen” and then getting to work. While this Spanish catch phrase is not easily translated, it roughly means “Pure Goshen”, or “Only Goshen”, or the “Best of Goshen”. 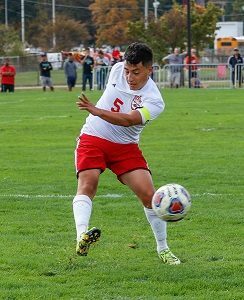 We encourage fans to continue to support the team as they take on Penn in Regional action at Merrillville High School Saturday, October 14th at 10:30 a.m. (EST) Merrillville High School is located at 276 E. 68th Pl. Merrillville, IN 46410. The championship game is set for 7:30 p.m., also at Merrillville on Saturday, Oct. 14th. Other teams in the Merrillville regional are Lake Central and Crown Point. They have had great fan support all season long, cheering them on in both English and Spanish, let’s not stop now! Let’s GO BIG RED!!! Puro Goshen!